The myth of Jewish literacy: Maristella Botticini and Zvi Eckstein explain why an emphasis on education has been bad for Jews. Has an emphasis on education been bad for the Jewish population? Photos by © Raimond Spekking/CC-BY-SA-3.0 via Wikimedia Commons; and Erling Mandelmann. 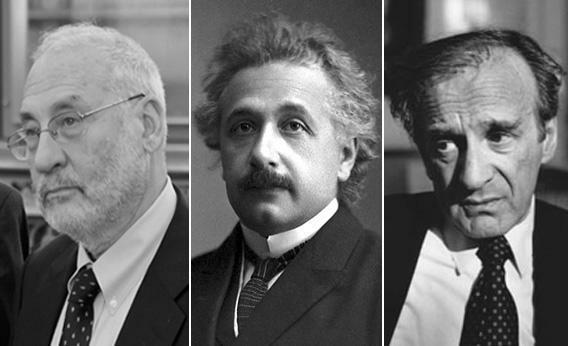 Every year, after the announcement of the latest round of Nobel Prize winners, the inboxes of many journalists are inundated with emails suggesting a crucial matter in need of investigation: why the Jews, only the tiniest fraction of the world’s population and only around 1 percent of the total population of the United States and Europe, have received more than 20 percent of Nobel Prizes. While the question can seem silly, it actually speaks to larger issues of educational and economic equality: how Jews have achieved success in the past and whether they’ll survive as a people in the future. Jews, as a whole, have done very well for themselves in the West since World War II: Besides the aforementioned Nobel prizes, American Jews, according to one of the largest studies, are nearly twice as likely to have a college degree as the average American and more than four times as likely to have a graduate degree. This translates into a serious economic advantage: American Jews are roughly 33 percent more likely to be employed in a high-status job category, and Jewish households here report around 25 percent higher income than the average American household. The core theory usually derives from a mix of two themes that stand out in Jewish history: an emphasis on education and a tendency to be persecuted. For the former, the rabbis of the Talmud and thereafter were fierce advocates of universal primary education, with the best-known example being a Jewish boy indicating his achievement of Jewish adulthood by reading publicly from the Torah at a bar mitzvah. (Universal primary education was boys-only until at least the late 19th century.) In regard to persecution, a common notion is that Jews weren’t allowed to own land throughout much of their history in exile and thus were forced to invest in a form of personal capital that could be of value across geographies. There are other theories, too, some even including a notion of simple genetic superiority, by way of an idea that Jewish communities modified natural selection through upholding scholars as examples of the proper way to be, providing them the choicest wives and expecting them to have many children. Maristella Botticini and Zvi Eckstein started jawing over the issue of the Jews’ economic history in the Boston University cafeteria 12 years ago, and the resulting research, conferences, and communication since has produced the first of a two-volume work, The Chosen Few, that tackles these issues in a way no one has before, taking an interdisciplinary approach to this basic question. By combining a very thorough look at the historical record with new economic and demographic analyses, the authors summarily dismiss a great many of the underlying assumptions that have produced theories around Jewish literacy in the past. Where many tied the Jewish move into professional trades to the European era when Jews were persecuted, Botticini and Eckstein bring forward evidence that the move away from the unlettered world of premodern agriculture actually happened a thousand years earlier, when Jews were largely free to pursue the profession of their choice. And where so many have simply taken as a given universal literacy among Jews, the economists find that a majority of Jews actually weren’t willing to invest in Jewish education, with the shocking result that more than two-thirds of the Jewish community disappeared toward the end of the first millennium. Botticini and Eckstein pore over the Talmud and notice the simple fact that it’s overwhelmingly concerned with agriculture, which, in conjunction with archaeological evidence from the first and second century, paints a picture of a Jewish past where literacy was the privilege of an elite few. But these rabbis were also touting a vision of a future Judaism quite different from that which had been at least symbolically dominant for much of Jewish history to that point. Where a focus on the Temple in Jerusalem, with ritual sacrifices and the agricultural economy they required being the standard to that point, these rabbis—broadly speaking, the Pharisees—sought to emphasize Torah reading, prayer, and synagogue. When the sect of Judaism that emphasized the Temple—broadly, the Sadducees—was essentially wiped out by the Romans shortly after the time of Jesus, the Pharisaic leaders, in the form of the sages of the Talmud, were given a mostly free hand to reshape Judaism in their own image. Over the next several hundred years, they and their ideological descendants codified the Talmud and declared a need for universal Jewish education as they did so. All of this history is widely known and understood, but what Botticini and Eckstein do differently is trace this development alongside the size of the Jewish population and their occupational distribution. The Jewish global population shrunk from at least 5 million to as little as 1 million between the year 70 and 650. It’s not surprising that a conquered people, stifled rebellions, and loss of home would lead to population shrinkage, but Botticini and Eckstein argue that “War-related massacres and the general decline in the population accounted for about half of this loss.” Where did the remaining 2 million out of 3 million surviving Jews go? According to them, over multiple generations they simply stopped being Jewish: With the notion of Jewish identity now tied directly to literacy by the surviving Pharisaic rabbis of the Talmud, raising one’s children as Jews required a substantial investment in Jewish education. To be able to justify that investment, one had to be either or both an especially devoted Jew or someone hoping to find a profession for his children where literacy was an advantage, like trade, crafts, and money lending. For those not especially devoted and having little hope of seeing their children derive economic benefit from a Jewish education, the option to simply leave the Jewish community, the economists argue, was more enticing than the option to remain as its unlettered masses. Two-thirds of the surviving Jewish population, they assert, took that route. This distinct twist of the population story, which accompanies research showing a shift from nearly 90 percent of the Jewish population engaging in agriculture to nearly 90 percent engaging in professional trades over that same several hundred years, addresses a key problem of previous theories of Jewish literacy: determining what happened to those who wouldn’t be scholars. Botticini and Eckstein bring other evidence of Jewish tradition generating success in trade. An extrajudicial system of rabbinical courts for settling disputes allowed for the development of the kind of trust required for commercial enterprises to grow. A universal language of Hebrew eased international negotiations. And in a devastating critique of the theory that persecution actually pushed this economic shift along, the economists examine the societies in which Jews originally developed this bias toward trades and find Jews faced no particular discrimination that would have made them less successful in agriculture. In fact, they show, Jews were often discriminated against precisely because of their emphasis on trade, such as in their expulsion from England in 1290, which only came after they were repeatedly told to give up the profession of money lending (eventually echoed in Ulysses S. Grant’s order to expel the Jews from the territory under his command during the Civil War). And so the Jewish people have grown into a people of two intertwined legacies: a culture in which the Jewishly literate continue to pass the torch and one in which an emphasis on trades was necessary to continue to do so for all but the most fervently devoted. When a given family stopped being devoted or wealthy enough, it simply faded away. The astonishing theory presented here has great implications for both the Jewish community and the broader world today. For an American Jewish community in which more than 75 percent of day school students are now Orthodox and the top concern for most Orthodox families in repeated surveys is finding a way to pay for ever-increasing tuition costs, the price of admission to the highly affiliated Jewish community is not just a large amount of ritual observance but also a basic need to join the 1 percent—or nearly so. Frequently, one can hear Orthodox Jews joke that $250,000 a year is “minimum wage” for the community; certainly, this overstates things but only by so much. In the New York area, elementary school often carries a price tag of $15,000-$25,000 in post-tax dollars per year; at the high-school level, some tuition rates are well into the $30,000 range. Outside of the New York area, tuition is generally lower, but so is the average income. And as Botticini and Eckstein predicted for their medieval models, modern American Jews who are fiercely devoted but without high incomes will endure significant financial sacrifice to maintain their Jewish lifestyles: The ultra-Orthodox enclave of Kiryas Joel, N.Y., is the poorest city in the country, and ultra-Orthodox communities broadly are frequently both poor and heavy recipients of government assistance. And for most of the 80 to 90 percent of families representing the non-Orthodox portion of the Jewish community in America, the cost of Jewish education has simply meant great numbers growing up without the ability to read Hebrew or engage with the Bible and other Jewish texts. Here we see precisely the same dichotomy that Eckstein and Botticini saw in the early years of post-Temple rabbinic Judaism: The especially devoted and wealthy provide their children with a Jewish education, but many others see too high a price in either or both of time and money and so choose a different path. And yet, so many of today’s unlettered Jews have been able to retain at least some sense of Jewish identity, where their predecessors 1,500 years ago could not. A majority of American Jews today are unaffiliated with the synagogues the Pharisaic rabbis emphasized, and yet 79 percent report feeling “very positive” about being Jewish. In part, Botticini and Eckstein would likely argue, that’s because of America’s unique tolerance of Jews, which removes the economic disincentive of maintaining an identity as a Jewish minority even when one doesn’t have a very strong connection to Judaism.